Introducing the next generation of "the original" oral equine hyaluronic acid! When Hyalun® was first introduced in 2001, we were considered pioneers in the field of oral hyaluronic acid for joint support. Hyaluronic acid was something most horse owners were familiar with, but only for injections, and taking it orally was very much a new concept. There were many questions at first- Is it absorbed? How well does it work? Well, eight years later, we are very proud to introduce the next generation of Hyalun®. We give you Hyalun® PRO. Hyalun® PRO still contains the same original, high molecular weight HA that we have become known for. However, Hyalun® PRO contains a higher amount of HA delivered per trigger squeeze. This is particularly effective for competitive horses and their joints that are subject to enormous amounts of stress. The high concentration of HA in Hyalun® PRO has been designed to assist in maintaining your horses healthy joints. On average, eighty percent of the horses in use today are used in recreational activites such as trail riding or low-impact labor. The remaining twenty percent of horses are involved in either some form of competition or a strenuous work environment. Hyalun® PRO has been designed to fulfill these needs. For those of you who have enjoyed our Hyalun® line, the original Hyalun® products are still available at your favorite retailers and on this website. 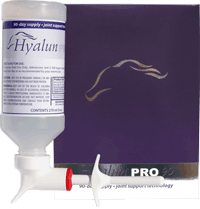 As you evaluate your horse's daily schedule, you can determine if Hyalun® or Hyalun® PRO is best suited for your horse.